The Democratic Party made a clear mistake in nominating a candidate as weak as Hillary Clinton when Bernie Sanders was polling much better against Trump and other potential Republican opponents. While matters are easier for Clinton with a candidate as awful as Trump, she does have a problem which the Democrats would not have with Bernie–motivating young voters to turn out to vote for her as opposed to staying home or voting for third party candidates. Democrats panicked by third-party candidates drawing support away from Hillary Clinton are ramping up their attacks against Gary Johnson and warning that a vote for a third party is a vote for Donald Trump. The Clinton campaign and its liberal allies are increasingly taking the threat from Johnson and Stein seriously, making direct appeals to young voters and punching down at the third-party candidates they view as potential spoilers. NextGen Climate, the group run by liberal billionaire and environmental activist Tom Steyer, is on the ground in eight battleground states with a message that is almost exclusively aimed at reaching the millennial voters who are energized by the issue of climate change. Last week, the group threw six figures behind digital ads mocking Johnson as a climate change denier and warning millennials that climate change will cost them trillions of dollars. A source at NextGen told The Hill the group will be looking to turn out young voters for Hillary Clinton and down-ballot Democrats with a texting campaign in the battleground states and a carpooling service that will drive them to the polls. The Libertarians have also attracted the ire of a group called ShareBlue, which is owned by longtime Clinton ally David Brock. The unabashedly pro-Clinton, for-profit media company has a strong following in the realm of progressive social media and has been using its platform in part to hammer Johnson as a flaky Republican. ShareBlue CEO Peter Daou, a veteran of John Kerry’s and Clinton’s past presidential campaigns, told The Hill he’s targeting Johnson and Weld from the policy side and making the case for why their platform should be anathema to progressives. Johnson and Weld hold liberal views on issues like marijuana legalization, abortion rights and non-interventionist foreign policy that have helped them gain traction among some young voters. But both former Republican governors tend to hew closer to the conservative orthodoxy on issues like taxation, minimum wage, Social Security and Medicare, environmental regulation, and school choice. While not true that Johnson is a climate denier as the pro-Clinton group claims, there are a number of problems with his views, including his views on environmental regulation. Even with these flaws, Johnson would be preferable to Clinton and Trump. All three have poor environmental records, making this a poor issue to determine who to vote for. Johnson is far preferable to Clinton on major issues such as opposing Clinton’s conservative views on military interventionism, civil liberties, and the drug war. 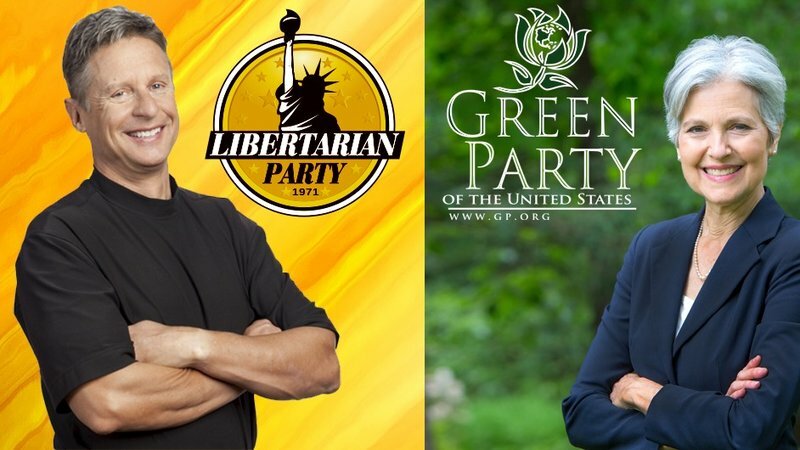 Fortunately Jill Stein presents an alternative to Clinton, Trump, and Johnson who shares Johnson’s views on these issues without the major drawbacks in other areas. While Peter Daou’s arguments for Clinton often are totally irrational, from ignoring the importance of avoiding unnecessary wars and defending First Amendment rights to attributing any criticism of Clinton to sexism, he does realize that Stein is a potential threat to Clinton. While the source of the attacks have not been positively identified, Clinton supporters have often been attacking Stein on line with fabricated attacks, falsely claiming this Harvard trained physician is anti-science and anti-vaccines. If the Clinton campaign really wants to contrast their views with those of Johnson and Stein, how about allowing them in the debates rather than using arbitrary rules to keep them out? That would be a far more significant debate than the one we had this week. Clinton is hoping that using Bernie Sanders as a surrogate will encourage millennial voters to turn out for her. It remains to be seen whether young voters concerned about ending the state of perpetual warfare will vote for Clinton even if Bernie is campaigning for her. Clinton faces a similar potential problem with Hispanic voters. Though Florida Hispanics back her by double-digit margins similar to the level of support Obama enjoyed, activists fear their turnout rate will be lower. Hispanics account for more than 15 percent of the Florida voter rolls and African-Americans are more than 13 percent. About 65 percent of registered voters are non-Hispanic white, and they heavily favor Trump.